AT&T’s 5G Evolution solution, which is not 5G and is really just upgraded 4G LTE, expanded to 99 new markets today. Their total number of 5G Evolution markets now sits at 239. To recap, AT&T 5G Evolution uses a combination of features like 256 QAM, 4×4 MIMO, and 3-way carrier aggregation to reach peak theoretical speeds of 400Mbps on a mobile device. 5G, on the other hand, could reach multi-Gbps speeds at some point, but will likely hover around the 1Gbps zone. While 5G Evolution is certainly capable of reaching ridiculous speeds, it’s no 5G. AT&T will continue this expansion of 5G Evolution this year to a total of 400 markets. Over the first half of 2019, they expect to have 5G Evolution connectivity nationwide. How can you attach to a 5G Evolution connection and get the bump in speeds? You’ll need a proper phone with support. As of today, the phones that work on AT&T’s 5G Evolution are LG V30 and LG V35 ThinQ, Motorola Z2 Force Edition, and Samsung Galaxy S8 and Galaxy S9 series. 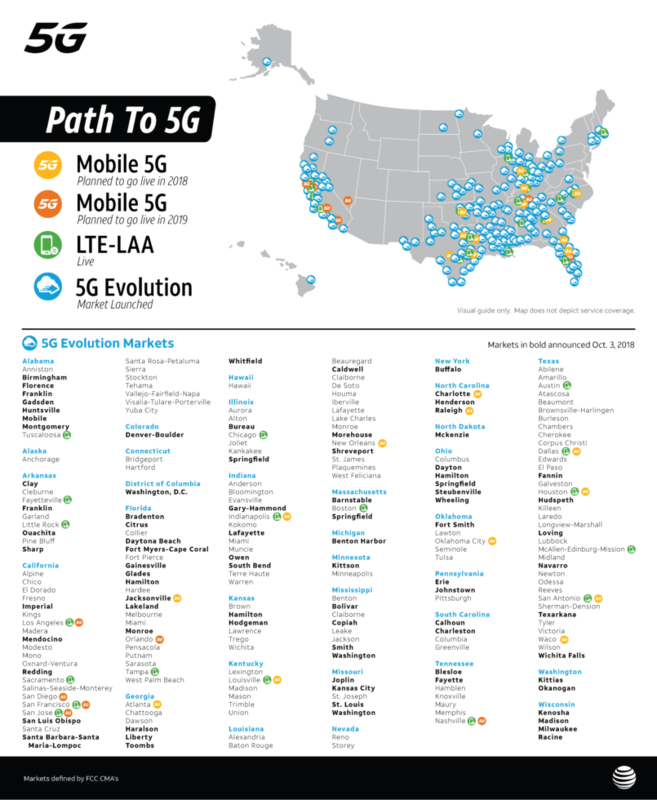 To see if you live in a 5G Evolution market, as well as one that supports LTE-LAA (another advanced LTE connectivity type that enables faster speeds), check out the refreshed map below.